Tammy Faye is known for many things, including her steadfast faith, the scandal that rocked a nation, and those oh-so-famous eyelashes. But above all, she is a survivor. No matter how often life has tried to push her down, Tammy Faye has always landed on her high heels. - Publisher Tammy Faye is known for many things, including her steadfast faith, the scandal that rocked a nation, and those now-infamous eyelashes. But above all, she is a survivor. No matter how often life tried to push her down, Tammy Faye always landed on her high heels. From her appearances on national shows such as Larry King Liveand Today, to her guest spots on Hollywood Squaresand the award-winning documentary The Eyes of Tammy Faye, she has proven that she is here to stay. Tammy Faye's journey has been a bumpy one-including divorce, cancer, addiction, and depression-but she has triumphed over it all, with her makeup intact. In I Will Survive . . ., she candidly recounts the lessons she's learned, surprising and delighting us with her unique insight on such topics as forgiveness, faith, and fashion. 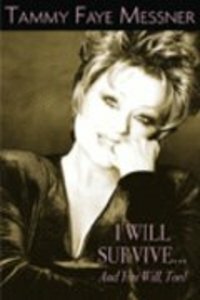 Chock-full of lists, quotes, makeup tips, and "Tammy Faye-isms," I Will Survive . . .is a one-of-a-kind handbook for living a fabulous life. Tammy Faye is known for many things, including her steadfast faith, the scandal that rocked a nation, and those now-infamous eyelashes. But above all, she is a survivor. No matter how often life tried to push her down, Tammy Faye always landed on her high heels. From her appearances on national shows such as Larry King Liveand Today, to her guest spots on Hollywood Squaresand the award-winning documentary The Eyes of Tammy Faye, she has proven that she is here to stay. Tammy Faye Messner helped build the three largest Christian television networks in the world: CBN, with Pat Robertson; TBN, with Paul Crouch; and PTL, with Jim Bakker. She has spent more than twenty-five years in television and now performs to sold-out audiences across the country.